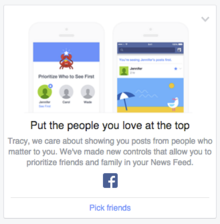 If you have friends, family and Pages that matter more to you than others, a Facebook feature now widely available lets you prioritize their posts over everything else in your news feed. To prioritize friends and pages, select the “Pick Friends” link at the bottom of the notification. This sends you to a page where you can browse through your connections or search for people and pages by name. Tap their profile pictures to add them; the next time you refresh your news feed, these users’ posts will display at the top with a yellow star icon to indicate it’s a prioritized post. Facebook suggests three additional steps to tweak your news feed. Next, it prompts you to unfollow people to hide their posts. Unfollowing a user is different from unfriending them; the former maintains your Facebook friendship, but removes their posts from your news feed, while the latter severs all ties on Facebook. 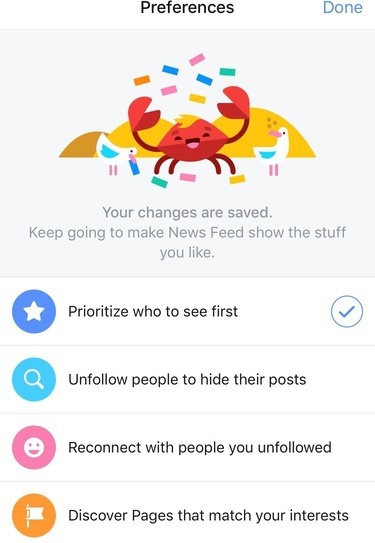 The social network also asks you to reconnect with people you’ve unfollowed – a handy reminder of the people and pages you’ve removed from your news feed in the past. To re-follow them and add their content back to your news feed, select their name from the list. Finally, Facebook suggests that you “discover more pages that match your interests” from a preselected list, presumably based on your interests. You can skip this – and any of the other steps – by tapping Done in the top-right corner. Facebook launched its last major update to news feeds back in April, when it announced that it was changing the algorithm that handled what posts, photos and videos it showed users.